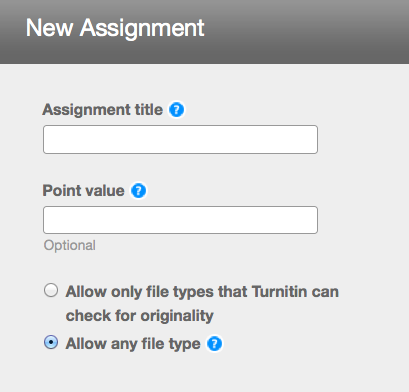 Follow instructions to create a class in Turnitin. Click the Add Assignment button. In the next screen select Paper Assignment. In the options window, check the option for Allow any file type. Instructors can view and grade images with the GradeMark tool (the Originality Report option will be disabled). Please note that Turnitin cannot assess the originality of image files. Originality Files can only be generated for selected text-based files (Word, RTF, text, PDF with text, HTML). If you need an Originality Report, then you need to ensure that Allow only file types that Turnitin can check for originality is checked. When the Allow any file type option is checked, students can upload almost any file type up to 20 MB in size. In the GradeMark tool, instructors will be given the option to download the file, but can provide feedback and grades within Turnitin.